Dave Splash Dot Com: The Return of The Dark Stuff Podcast? The Return of The Dark Stuff Podcast? Ever since I ended my podcast, The Dark Stuff, a few years back, I have been plotting its return. Initially, the idea was to make it similar to my weekly radio show. I would play music and offer commentary or insights about said music. That worked for a little while until I realized how non-unique the format was. There were a million podcasts just like it. So, I decided to change it a little bit by bringing in a co-host who had different musical taste than I do. That worked okay for a little while, but still left me unsatisfied. Next, I decided to add a new wrinkle to the show by focusing on obscure or under-appreciated bands from 1990s. I would interview someone from the band; and through their storytelling and my observations (as well as the music), these bands would be introduced to a whole new audience. It worked pretty well. I interviewed members of Swervedriver, Madder Rose, The Meices, Overwhelming Colorfast, and some others. The format worked well until my computer crashed and I lost the software I was using at the time. The Dark Stuff podcast ceased to exist at that point. Now, years later, I am in the early stages of bringing it back. I don't want to just repeat what I did in the past. That would be boring. Furthermore, it is very difficult nowadays to play music on a podcast without going through official channels and paying tens of thousands of dollars. So, I want to do an interview show. I know what you're thinking....there are a million interview podcasts! That's practically all there is. Yes. This is true. But, in my mind, the key to hosting a successful interview show comes down to two things: the interviewer and the guests. I think I am good interviewer. 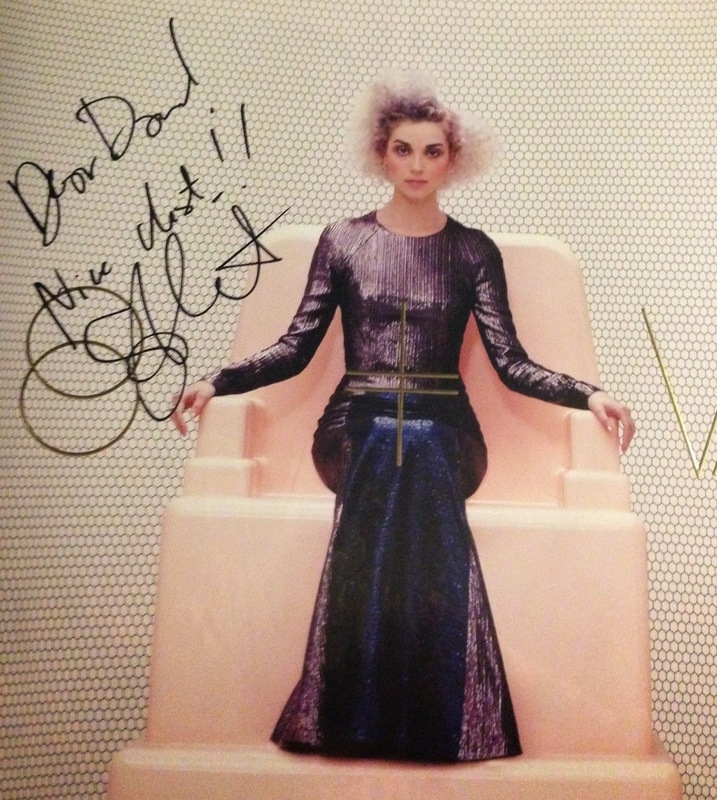 And I recently had this confirmed when I did an interview last week with Annie Clark (who records and performs under the name St. Vincent). I was supposed to get 5-10 minutes with her, but the interview ended up going on over 20. That is always a good sign. Later on that evening, I was told that Annie was pleased with the interview and had a good time with me. Great. This is someone who is interviewed multiple times a day and has a very low tolerance for stupid/boring questions. If I passed her test, maybe that is a sign that this whole concept is a solid one for me. To keep the show fresh and to have a wider audience, I am planning on interviewing people from a number of professions and walks of life: entertainers, business people, religious people, restaurateurs, political figures, bands, whatever. I know all sorts of people, and most would be comfortable being interviewed by someone they know. Having a mix of "celebrities" and "regular" people would be unique, I think. Kickstarting the show with someone as high profile as St. Vincent would really get the name out there. Anyway, this has been my long-winded of telling you keep on the lookout for the return of the Dark Stuff Podcast.